We are planning a surprise trip to Disney and before we go I would like to make them some disney wear (Tees with mickey heads and skirts for daughter. 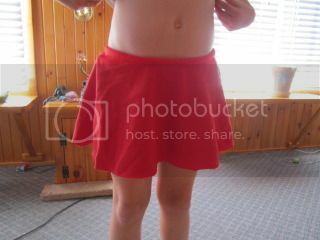 So I looked up simple circle skirts and I think I can do this. I didn't really have fabric at home but I did make a quick one for daughter. I had no elastic to put in the top and I goofed up so I had to add a piece but I think I can do this. I didnt hem the bottom as it is already too short I was just getting an idea. So this is my attempt to sewing. here is a picture, sorry if this is too big I am not sure what I am doing. Nice. You've got a good start. I would make a seperate casing for the waistband and put the elastic in that. As for the length if you add a ruffle it will add length plus look cute. You can do it. So easy. It will act as the hem too. Figure out the circumference of the skirt (math class actually had a point after all...lol). Then double it. Decide how long you want the ruffle to be. 2“ is nice. Double that number. Now you know the length and width of the strip(s) you need to cut. You will probably have to sew together multiple strips to make the strip long enough. When you have all the strips sewn together sew the first one to the last one making a huge o. Fold in half with the good side showing and your raw ends lined up and iron all around your o. Set the longest stitch on your sewing machine and leave a long end of thread (don't backstitch) sew all the way around your o. Pull the loose threads gathering your ruffle evenly until it is the size of the skirt bottom. Pin into place and sew on. That is super cut, you did a good job. That would make the skirt longer but it won't look as good as a ruffle plus you will use a lot of fabric and waste a lot of fabric too. I watched the fist couple minutes of this video and she explains it well How To Add A Ruffle - YouTube She hemmed her ruffle first which is good and uses less fabric. For a full skirt like yours 2x the circumference of the skirt is plenty full enough for a ruffle. ETA- she does something weird and sews over her straight pins. I always take them out as I go. I have broken too many sewing machine needles trying to sew over straight pins. I don't do it anymore. Last edited by MomLiz; 08-27-2012 at 09:49 AM. Planned c-section or attempted VBAC?